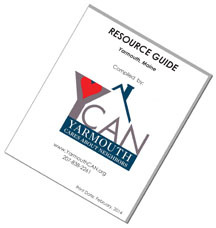 The 2017 version of the Yarmouth Cares About Neighbors “Resource Guide” has just been published. It lists information about all known sources of assistance for people living in the Yarmouth, Maine area. Please visit our Resource Guide page for links to downloadable versions of this guide (one for single sided printing, and a separate one for double sided printing). Printed versions of this updated guide are free, and will be available at Town Hall and Merrill Library after May 25, 2017. If you require up-to-date information sooner than that, please click on the link above to see the on-line version of the Resource Guide. The CA$H (Creating Assets, Savings and Hope) program offers free tax preparation and financial wellness resources to low and moderate income households. Free tax preparation saves the typical client $175 in preparation fees, and over the past 10 years in the Portland area has provided $1.2 million in free tax preparation services, while helping 6,077 individuals and families receive more than $10.9 million in federal and state income tax refunds, and apply for $3.2 million in federal Earned Income Tax Credits. CA$H is recruiting volunteer tax preparers, interpreters, greeters, intake & asset guides, and schedulers. No tax experience is required and we provide free training and IRS certification. The volunteer orientations begin November 18th at 6pm.